Supporting charitable causes is a big part of who we are as a business. That's why we started Do Some Good, our charity campaign. We support a number of local and international charitable organisations, including Fareshare, an organisation that redistributes surplus food to homeless hostels and clubs and groups that provide meals for children and the elderly. Their valuable work stops food from going to waste and helps vulnerable people to get healthy meals. We were also very pleased to hear from charity: water, a group for which we raised £14,800 in 2016. They let us know that with our help, a project which we sponsored had just been completed. Now, 376 people in a remote area in Mozambique have access to clean water from a newly drilled well. Please join us in supporting these causes by sending us photos of your new Lazy Susan furniture. For every set of photos of your garden furniture in its new home we'll donate £10 to charity. For pictures including friends or family during a garden party or barbecue, or of a nicely dressed table, we'll up the donation to £20. We appreciate all our customers' support so far. Let's keep up the good work. You will find our most popular models of modern 6 and 8 seater garden furniture here as 4 seater varieties. So if you’re looking for contemporary 4 seater garden furniture, you’re in the right place. Our 4 seater furniture sets come in a variety of colours, and look superb both as indoor and outdoor furniture. 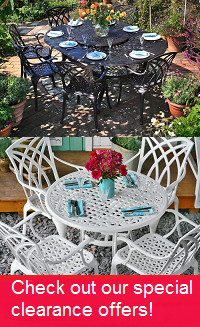 All of these garden tables are made from durable, lightweight and weatherproof < href="https://www.lazysusanfurniture.co.uk/cast-aluminium-furniture/">cast aluminium. Some feature a durable glass table top. Thanks to these materials, our 4 seater modern garden tables are weather-resistant and low maintenance. Unlike wooden or iron furniture, cast aluminium garden furniture doesn’t rot or rust. Your 4 seater modern garden table and chairs won’t need sanding, varnishing or oiling to prevent the elements from ruining it. Leave it outside all year round and come spring it will look as great as ever. Use a clean, damp cloth to clean the table. For the glass table top, a squirt of standard glass cleaner and wipe over with a clean cloth is all that’s needed to keep it in optimum condition. The Chloe table is a modern square garden table with an easy to use extension mechanism which increases its length from 90cm to 180cm. It comes in grey, black, white and champagne, and white and grey. The rectangular Daisy table is an extendable 4 seater garden table that could fit either a chair on each side, or two chairs each on its long sides. It is sold in black, grey, white and grey, and white and champagne. White is an ever popular colour for classic styles of garden furniture. But if you’re looking for modern white garden furniture, just select white in the sidebar under ‘metal finishes’ to refine your search to models in this colour. Bear in mind while you’re browsing that we offer fabric and metal samples free of charge, to help you decide which colour is the right one for you. Another thing that we’re happy to provide is touch up paint. Rarely do our customers find anything wrong with the paintwork on our garden furniture, but if you do notice minor damage or a scratch somewhere, get in touch with us. If a lick of paint is all that’s needed to solve the problem, we’ll send a pot of touch up paint in the colour you need, free. All our 4 seater garden furniture sets come with a choice of chairs. Choose from the Lea, Milly, Georgia and Abigail chairs according to which suits your taste best. One chair model will always be available at no extra cost, but you can select another for between £10 and £25 per chair. Depending on the model and colour you’re looking at, one or more chairs may be available in multiple colours. If you’re looking at the Ruby table in grey, for example, you can combine the Milly or Abigail chairs with it in either grey or grey and black. Our chairs are made from cast aluminium and a durable, outdoor mesh fabric. Every chair in this range is a stackable chair, making tidying them away and storing them convenient and simple. Don’t forget to take advantage of our amazing offers before moving on to the checkout page. We offer some fabulous discounts on all kinds of garden furniture when you’re purchasing a modern 4 seater furniture set. Get up to 70% off of a sun lounger, garden bench or side table! You may well find something that compliments your new contemporary metal garden furniture. If you’re looking for a bargain, take a look at our clearance page, too. There are fantastic deals to be had on everything from sun loungers to 10 seaters. The deals you find here won’t be repeated. Our modern square garden furniture and rectangular garden table sets in the 4 seater range are both subject to free delivery. So there’s no need to worry about additional charges on the checkout page. Our partner couriers Parcelforce and Geodis both offer online tracking of orders. For more details about delivery you can have a look at our delivery information page or give us a call. The friendly Lazy Susan team is on hand to take your calls or answer your emails from 08:00 to 18:00 daily. They can provide more information about our garden furniture, help you with assembly instructions or respond to any other queries you have. Call us on 01243 717107 or email us at [email protected]. We try to answer emails within 2 hours during office hours.